Chop the potatoes in to chunks and place them into a pot, and fill with enough water to cover. Sprinkle in some sea salt and bring to a boil, then cook for about 10 minutes, or until tender. Drain, and set aside to cool. Place the bacon in a large deep skillet over medium-high heat. Remember I recommend the thick cut bacon which I get over at Western Beef. Fry until tender. Now I know many people out there like their bacon crisp, and if they want to cook the bacon into burnt offerings then I’m not going to stop them… heathen. Once the bacon is done, remove it from the pan and set aside. Now, add diced red onion to the bacon grease, and cook over medium heat until browned. Add the vinegar, water, sugar, salt and pepper to the pan. Bring to a boil, then add the potatoes and parsley. Toss in half of the bacon. Heat through, then transfer to a serving dish. Crumble the remaining bacon over the top. Now I prefer to serve this warm with some pork chops cook in sauerkraut, and a side of red cabbage with apples… and of course a really good beer or two. Prost! As holloween approaches I thought I would share with you the secret to “blood” soup. 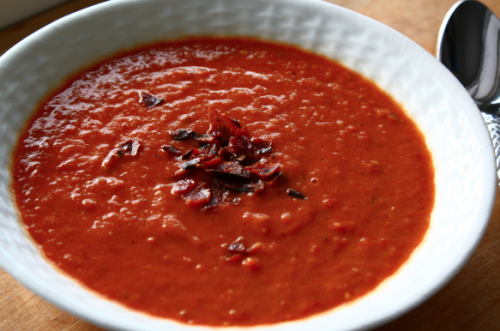 A perfect soup course to any holiday par-tay! Impress your friends and gross out the neighbors. Preheat oven to 400°F. Slice the tomatoes lengthwise and place them, on a large baking sheet. Sprinkle them with salt and pepper, and drizzle them with about 3 tablespoons of olive oil. Roast this until the tomatoes are tender, about 1 hour. Cool slightly. Heat about 3 tablespoons of olive oil in large pot over medium-high heat. Add minced garlic and sauté until toasty and fragrant, about 3 minutes. Add chicken stock and deglaze. Stir in tomatoes, rosemary, thyme and dried crushed red pepper. Bring this to a boil. Reduce heat and simmer uncovered until soup thickens slightly, about 25 minutes. Then break out your immersion blender. I can’t say enough nice things about immersion blenders these things are just essential to good soup making. You don’t have to transfer stuff from a hot pot to a cold blender, nope! just blend to a consistency of your choosing right there in the pot. Note well! PLEASE, make sure the blender is fully immersed before you turn it on, and after you turn it off. Trust me, your walls and shirt, especially the really nice white ones, will thank you if you do. Ladle this out and serve in nice soup bowls. Top with a garnish of fresh chopped basil and accompany with toasted garlic baguette slices. Bluefish… Long Island and bluefish… they just go together like Vegas and showgirls although if anybody offers you a recipe for showgirls with lemon and mint leaves… stop talking to them. Whisk together the garlic, oil, lemon juice and zest, toss in a pinch of sea salt and pepper to taste. Stir in the chopped mint leaves. Add the fish and coat the fillets thoroughly. Cover and marinate in the fridge for 1 hour. Transfer the fillets to a shallow baking dish. Pour a bit of the marinade over the fillets and pop the into a 350 degree oven for 20-25 minutes, until fish flakes easily with a fork. I like to serve this on a bed of couscous, and there is a whole lot of things you can do to accent your common couscous, but that’s another recipe. 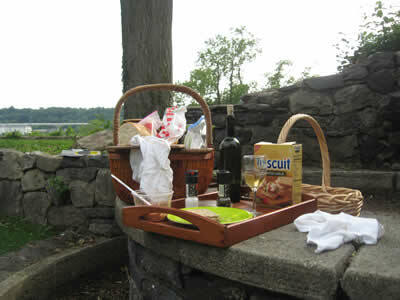 This weekend’s picnic reminds me of another picnic we had this summer at William Cullen Bryant – Cedarmere estate. I made a cold scallop salad perfect for summer days. Stuff the flavor items into a spice ball and place it in a large sauce pot with the water and wine and bring it to a boil. Once this liquid is nice and fragrant, add the scallops and reduce the heat to a simmer. Simmer for about 5 minutes or so, just until the scallops are opaque. Then, strain them out and pat them dry with a paper towel, and then toss them into a metal bowl and into the fridge to cool. Once their nicely chilled, about an hour… add the onion, celery, pickles, pepper, and sea salt. Fold in the mayo and gently combine. Pack this in a container with a chill pack in your picnic cooler and a head of Boston lettuce. I like to use the Boston lettuce because it fits in the martini glass perfectly on which to scoop the salad. 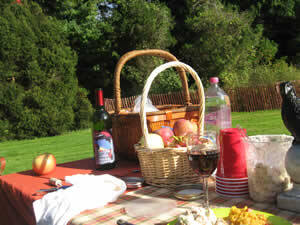 We just had another picnic over at bailey’s arboretum with friends. Now, I had brought home some smoked chicken from Dad’s house, and picked up a couple of nice Macintosh apples when I was up there. So, for the picnic, I made a warm apples sauce, and a smoked chicken salad. Cut the chicken into bite size chunks. Then, core, peel, and dice up the apple. Dice the celery and onion. Put these into a large bowl. Give it a dash of salt and pepper. Then fold in the mayo. Transfer this to a plastic quart container, the ones the wonton soup comes in… and toss it into the picnic basket. I like to serve this on top of pumpernickel bread. He who smelt it… well, I like smelt. 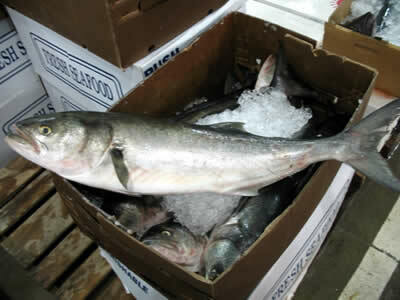 They are traditionally a winter mainstay and are often caught while ice fishing. They look like salmon but they are much smaller, usually under a foot long, but some species can get up to two feet. Where the heck they would walk to is anyone’s guess I suppose. But, I digress. Thoroughly mix the flour cornmeal salt pepper and paprika. I use a Hungarian ‘half-sweet’ paprika which is a blend of mild and pungent paprika types. It has a nice smokiness about it that I find irresistible. Dip the smelts in the half and half then roll in the coating mixture. Heat the oil in a large heavy skillet. I use a nice Loge cast iron skillet for this. Fry the smelts for about five minutes on each side, they should be nicely browned. When they are done, place them on a paper toweled plate to drain, I usually serve these with boiled Long Island potatoes and warm red cabbage with apples, ah, but that’s another recipe. I just got back from being upstate. Its apple season up there, and I got a really good deal on butternut squash, so its soup time. Core, peel, and dice the apples, I usually use fresh McIntosh apples. Then peel and seed squash and cut into chunks. Finely dice the onion. Toss the squash, apples, onions, salt and pepper to taste, broth and water in a large heavy saucepan. Bring to a boil and then lower the heat to a simmer. Let this cook for about half an hour, till the squash gets nice and soft. Now, I puree soup in the pot using an immersion blender, then bring the soup to a boil. Then reduce heat to a simmer. Then, add the half and half. Serve hot with fresh bread. 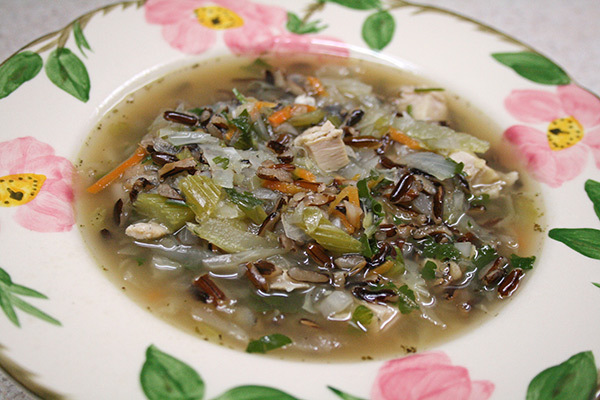 Rye bread goes nicely with this soup. What to do with that can of salmon at the back of your cupboard? Fisk cakes of course. I love to whip these up using a bit of celery a half nibbled carrot and the last of those flaky mashed potatoes. Yes fishcakes are a nice way of cleaning up the fridge. Crabs, they are a lot like ants in that you need a lot of them in order to get anything done. There is so often so little meat on our local little dock-side dwellers that you need half a dozen to whip up so much as a sandwich. But, today that’s what we’ll do… lets whip up a crab salad sandwich. I flake the crabmeat with fork to get it all nice and fluffy. Then toss the diced onion and celery into the bowl and mix this really well. Then, add the mayo and the horseradish sauce. I like using Gold’s Horseradish Sauce in the squeeze bottle. Mix this well, then add a little salt and pepper to taste. Now that he mixture is prepped, let talk about bread. I prefer to make this sandwich on well toasted rye bread, the seeded one. I toast up the bread, then drop a leaf or two of Boston lettuce on it. I like the leafier Boston lettuce for this sandwich as it tends to have a thinner leaf that the iceberg and a more uniform shape for holding the salad than the red or green leaf lettuce varieties. This is a good sandwich to cut up and serve as an accompaniment to Manhattan clam chowder.